Advantages: The definitive work to date on the Ho 229; excellent coverage of flying wing concept, development, testing and operation; readable and interesting text; high quality artwork; scale drawings by Arthur Bentley, attractive layout. "Air War Classics" is the flagship Luftwaffe research series from Classic Publications, and the first eleven volumes have all been groundbreaking and authoritative in their specialist subject areas. The latest in the Air War Classic series is no exception. 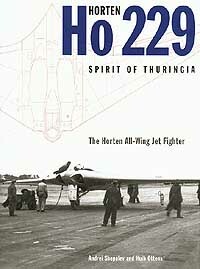 "Horton Ho 229 - Spirit of Thuringia" is presented in a hard cover behind the familiar Classic Publications grey dust jacket. The book comprises 128 pages - a relative thin volume in this series. Even so, the book does a good job covering this pioneer of the military flying wing concept. The Horten brothers originally developed their vision of an "all wing" aircraft during their early gliding experiences during the late 1920s and early 1930s. As revolutionary as this idea seemed, the Hortens were inspired by the existing tailless designs of Alexander Lippisch, which followed in the footsteps of John Dunne, whose tailless design had made a crossing of the English Channel as early as August 1913. The Horten brothers developed this idea to a practical stage, and by the end of the Second World War had designed a useful, jet-powered military flying wing, the Horten Ho 229. The claims for the performance of the Ho 229 are truly remarkable - able to operate from unpaved airstrips, 7g tolerance, absorbing heavy punishment, delivering a bomb load of one ton up to 1,000 km from its base. What was true, and what was propaganda? This book examines these claims, and much more. The authors' text is logically laid out, comprehensive and informative, while remaining admirably readable considering the technical nature of much of the subject matter. The text start with a discussion of the Horten brothers and flying wing theory, moving on to the development, construction and flying of various unpowered and powered prototypes. This makes way for a detailed description of wartime gliders and bomber development, ultimately leading to the Ho 229. The layout of the book is punctuated with 200 photos, technical drawings, maps and tables, ensuring that the reading is never laborious. The colour artworks by Andrei Shepelev are very attractive. It is also very pleasing to see 15 pages of gorgeous technical scale drawings, skeletal cutaways and scrap views by renowned illustrator Arthur Bentley. The book is rounded out with a colour walkaround of the last surviving Ho 229, the V3, at the Paul E. Garber restoration facility of the National Air and Space Museum. Little has been published to date on the Horten Ho 229. This newest work in the Air Classics series is the definitive work on the subject to date, and will be fascinating to Luftwaffe aficionados and flying wing enthusiasts alike.